"So how did you guys know to come here?" Mary asked as Rachel helped her out to the station wagon to go to the hospital. "I saw the note taped to your locker. I was really pissed that you didn't tell me about it as soon as you came out to lunch." "I hadn't seen it yet." Mary gave Rachel a sideways glance. "I did want to tell you when I saw it after lunch, but you'd stormed off." Rachel sighed. "Oh geez, I'm such a bad friend." She opened the door for Mary and helped her get into the station wagon. "No, you're not. You were awesome today. So you saw the note and called Grandma?" Rachel nodded. "I was mad, but I knew you needed help. You can't do everything yourself, Mary." Mary lowered her eyes and nodded. "I know and I will tell you everything. I'll bore you to tears with everything." Rachel grinned. "If I start snoring, just poke me." Mary smiled back. "I expect to be told things too. Next time, you will call me before facing something like this again," Grandma told her as she got into the driver's seat. Mary nodded again. She was beginning to feel like a bobble head, but she deserved it. She hadn't been thinking when she'd rushed to Cy's house. Kyle got in on the other side of the car. Mary gave her grandmother a questioning look through the rear view mirror. Her grandmother shrugged. Grandma started the car and turned to Rachel. "I'll be back shortly to help with the rest of the cleanup." "You better. I might mix cleaning chemicals or something. There are many reasons my family has a housekeeper." Mary grinned and waved to Rachel as they drove away. The grin slipped away when she turned back and stared at the back of Kyle's head. Why was he coming with them? Mary sat in an uncomfortable silence beside Kyle in the emergency room. At the house, Grandma had looked at Kyle’s head and cleaned the cut made by the lamp. It wasn’t bad enough for stitches. Grandma had interrogated him thoroughly about how he felt. She'd looked closely at his pupils and decreed that he didn’t have a concussion. He didn't need to see a doctor, but he’d come with them to the hospital anyway. He hadn’t said anything since they'd left his house. After helping Mary fill out the insurance forms, Grandma had left to go back and finish helping Rachel clean-up the Ashers' home. Mary didn’t know why Kyle stayed with her. It was like he didn’t want to let her out of his sight. Mary sat there in shock. She knew exactly which day Kyle was talking about. She’d lured Kyle into the basement. “Ricky decided for you to wear the locket. You didn't have a chance from the get go.” She wasn’t sure if her words were to reassure him or herself. Mary smiled. Even if it had been Kyle's body that had terrorized her for the past couple of days, it hadn't been Kyle, the person. She was beginning to like Kyle, the person, or at least, she didn't detest him. “I should've been stronger,” Kyle murmured. “It wasn’t your fault,” Mary assured him again. “Thanks,” she said. With Kyle’s and the nurse's help, she got into the wheelchair. Her ankle had swollen to the size of a grapefruit, and the tiniest weight on it hurt like a thousand bee stings. As the nurse prepared to take her to an examination room, she turned back to Kyle. “Go home and help with the clean-up. Tell your parents you accidentally destroyed the microwave. They’ll believe you. Don’t worry about it. It’s all over.” Kyle nodded. “Thanks for, you know, saving me and stuff,” he said, suddenly self-conscious. Mary smiled back at him. Mary sat silently in the front seat of her grandmother’s old station wagon on her way to school. The doctors had said she shouldn’t do a lot of walking for the next month. Yep, she had sprained her ankle and was using crutches in the meantime. How Kyle had ended up with the locket still troubled Mary. She felt culpable, and she didn’t like that. She’d been trying to help, but maybe she’d made things worse. “Why did you send Kyle to the basement?” Grandma asked. “Oh,” Grandma said. She took a deep breath through her nose and looked out the windshield in thought. “It’s my fault Kyle got possessed. Isn’t it?” Mary scrunched down in her seat unhappily. “I know, but someone may come across your path like Cy did that you will want to help.” Mary nodded and gave her grandmother an easy smile. Once again, the fortuneteller had cemented her claim to coolest Grandmother ever. Mary waved goodbye as her grandmother pulled away from the school. She was struggling with a side door into the school to avoid most of the early morning crowds when a nice person pushed the door open and held it for her. “Thanks,” she said. She was too preoccupied with her crutches and her book bag to look up at the person. “Mary, what happened to you?” Mary raised her head in surprise. Cy stood holding the door for her. “Um, I sprained my ankle. It’s no big deal,” she said. Mary stared at him in surprise at his interest. She briefly thought about telling him the truth. ‘Well, it happened while I was saving your house from a homicidal ghost. Sorry about the microwave,’ but she decided against it. It would be her little secret, along with Kyle’s and Rachel’s and Grandma’s. Okay, maybe it wasn’t such a little secret, but none of them would tell what happened. It was too weird, and Cy had already proven that he couldn’t handle weird. Mary wished that she didn’t have to lie to Cy, but this would have to be like her secret identity. She’d be regular old Scary Mary at school, and Super Scary Mary, at other times, able to vanquish ghosts with common household appliances, but she was not going to run around in a cape and change clothes in phone booths. Some things were just silly. Rachel would probably do it. “Okay,” Cy repeated with a grin. He took Mary’s backpack and walked with her to her locker. Mary was quiet on the trip. She feared that the only reason he was walking with her was because of the crutches. As soon as they were gone, he’d be gone. He was just being nice, but he didn’t have to help her. Did this mean there was hope? Could they become friends again eventually? Mary stole a look at Cy. He was looking down the hall. He didn’t seem tense or nervous to be with her. He looked relaxed and maybe even a little happy if the upward turns at the corners of his mouth were any indication. Cy glanced at her from the corner of his eye. He caught her looking. He turned and gave her a full grin. Mary quickly tilted her head down. How did he always catch her looking? She knew that she was probably blushing a little, but she was smiling too. Mary quickly glanced at Cy. “Why?” she asked. Kyle should’ve returned to normal now that Ricky’s influence had been removed. Mary smiled to herself. “I wouldn’t worry about him. I’m sure he’ll grow out of it.” Cy grinned and escorted her to her first period class. He gave Mary her books and left with a wave. Mary sat in contentment. Her life was going really well. She’d patched things up with Cy, she’d taken care of a nasty ghost, and she wouldn’t have to participate in gym for the next three weeks. Yes, life was looking good. The intercom system clicked on. “Mary Hellick, please report to the guidance office.” Mary scowled. Scratch that. Life had been looking good. Mary leaned her crutches against the wall and hopped over to the chair. She shot Mr. Landa a frown. If only he knew what could happen in two weeks. “Eastern Snyder frowns heavily on skipping classes,” he continued. “I’m sorry. I would’ve gone to class if I hadn’t been in the ER,” she said. Well, that's the end of Scary Mary. If I missed something, please let me know. Thanks for reading this. I am working on a sequel, but it is only in the planning stages right now. I will be launching a new story titled Unicorn Bait. Look for it in a month. Finally, you updated. I was beginning to think that something had happened to you, glad to know you're okay. Love the ending. Where are you going to be posting 'Unicorn Bait'? Unicorn Bait will have its own blog once I get the design right and have chapters ready to post. I hope to start in a month, but Nanowrimo is upon me and I want to complete that. Sorry for being late today, I didn't actually get home from vacation until late Wednesday night, then I went to work Thursday, and it just sort of hit me, I have to update Scary Mary! Anyhoo, I'm glad you enjoyed it, Parchment Quill. Thank you for all your comments! Thankyou, thankyou, thankyou, for your wonderful story. I have thoroughly enjoyed each and every word. Hoping you do do a sequel to it. Will be keeping my eye out for Unicorn Bait. wow ... I just read all the chapters just then ... and I thought it was brilliant! I'll be looking forward to the sequel and Unicorn Bait. Loved it. The ending made me smile. I would love a sequal. Any info you can give us on that? Thanks Azzitizz and Anons for your kind words. I'm hoping to begin Unicorn Bait in December. That was one awesome story. I can't wait for the sequel! I saw your ad for it on the NaNo boards, and I'd reply to the thread but I can't find it again. Thank you so much! I posted on the Shameless Promotion Thread. Here's a link to my post. I'm glad you liked the story. A sequel is in the works, but it will be a long time coming. I am currently posting chapters to Unicorn Bait. WOW!! Great story. I really enjoyed it. Looking foward to the sequal. Thanks so much, madtru! I'm working on the sequel, but it's tough. Oh, I sort of had hopes for Mary/Kyle by the end, but there's still room for that in the sequel, eh? I loved the end, and was sorry to see the story finish itself up (even if there was plenty of room left for the sequel). originalpuck, thank you for reading Scary Mary. I gotta say, with everyone asking for a sequel, it makes my fingers itch. Oh my god! I LOVE this story!! I can't wait to read the sequal and your other stories!! So about that sequel...? ::grins:: By the way, I have hope for a Kyle/Mary happy ending as well! Thank you so much for your comments. I'm so happy you enjoyed it. And the sequel is still pretty far away. Sorry. I just got through reading Scary Mary and from the first word to the last it had me locked in my seat . Great story Enjoyed it immensly. Wonderful story! I truly enjoyed reading each work of it. Thank you. I enjoyed the story a lot, it's the best i've read in a while! it was great...the ending made me smile....superb ! It was good. I would have liked to see her end up with kyle though. Cy did turn his back on her after getting to know her. Thank you, Anons for all of your kind words. I'd say how many thumbs up I give it but I kinda ran out of thumbs..
Hee. Thank you, Gemmaroonies. I'm glad you enjoyed it. at first, i actually thought this was a real book. but then, i realized it was an incredibly stupid tale. I dont know why these, like, parchment quill and azzitizz ppl actually like it. BUT, props you you, windvein, i dont have the tolerence to write a story like this. Oh, by the way, you should change mary's makeup, bc it actually does make her superwierd if shes wearing like, black lipstick. uh, gross!! I thought Scary Mary was briliant. I couldn't stop reading til I reached the end. I look forward to the sequel. Huh, anon, your comment must have gone to my spam folder. Black lipstick isn't that weird...I wore it when I was in high school, but I can get that some people might not like it. OH MY GOSH!!! This whole story was like the best i have read in quite a while. I mean, I am nineteen but i am so into stories and movies about witches and such. Can't wait to read the sequel. Also forget Cy and put Mary and Kyle together. but I am not sure about the title.. scary mary. .blaah she has cero/nada/nothing scary..but ooh well its your book right?? Thank, Luniiz. Mary is a sweetie. It's only the mean girls (aka Vicky's posse) that call her Scary Mary. it was really fun to read. :) A little bit predictable, but still pushing me to continue reading. Some paragraph made me smile, some let me get some goose skin. And finally you got me with the twist of the second, freed ghost from the locket. Thanks for your comments. They are food for thought. This was an AMAZING story! I was bored and looking through different free online books, and this one came up. I folowed the link, and got so into it! Great job! Xenophon Hendrix mentioned this story at his blog, and I'm glad I followed the link; one long read later, time to check out your other stories! Obviously, I enjoyed Scary Mary. Thanks for stopping by! I'm really honored to be linked to by Xenophon Hendrix. Hope you like my other project. a realy interesting storyline, ove the ending. i found it hard to stop reading it at timnes! Thank you, Stacy and Anon. Very high praise indeed. I'm blushing. Better than BtVS? Nooo. No one's better than the Buffster, but Mary and she would probably get along well together. This is by far the best story I've ever read and it didn't even take me that long. Your subtle humour, wit and sarcastic-ness made me crack up in every single chapter--I love it!! Am hoping you make your writing known. Your skills deserve acknowledgment. Thanks, Anon. Glad I tickled your funny bone. I've been meaning to read Scary Mary for a while and finally got around to it. It was very much worth it. I'll have to check out Unicorn Bait sometime soon. Thank you, JZ and anon. You're very kind to comment. I hope you do check out Unicorn Bait and enjoy it as well. I couldn't stop reading it. Not the greatest story ever but I have to admit that it kept me hooked (I wasn't planning on reading the whole thing in one go but couldn't stop :)) You definately have potential and judging by your work and style of writing you must be your late teens, so best of luck for the future! I hope that you make a career out of this. Even though the storyline was sort of raw and predictable, I loved your wit and well etched characters. This is the first time I've read an online book (I was just browsing and thought I'll give it a go) and I'm glad it was yours. Reading the comments were a treat in itself, Its an added bonus to see how others are reacting to it. Keep on writing! :) I'll try to catch up with more of your work whenever I get the time. Thanks for commenting. Regarding my age...I'm not in my late teens...I think I'll leave it at that. Hope you enjoy my other work. Thanks. This was an awsome novel! I read it all in one sitting. I can't wait for a sequel or anything else by you for that matter! Keep writting and good luck! First, I guess I should say, this is me Windvein. My stuff will be signed as S.A. Hunter now. Sorry for any confusion. And thank you, verahogan. I'm working on the sequel now. Have over 10,000 words written. Want 50,000 so I got a ways to go. Well, it seems I'm a somewhat backwards person, as I came here after reading Unicorn Bait. But the up side is that it convinced me to read Scary Mary, which I shied away from at first, since I'm not a fan of the occult. Your humor and wit in Unicorn Bait induced me to read a story I would not normally have looked at, and I was not disappointed. It's kept me well entertained while I've been cooped up inside in the days following Hurricane Ike's assault. Thank you for your wonderful stories and congratulations on becoming one of my new favorite authors. *smiles* Here's hoping Scary Mary's sequel keeps me smiling and laughing as much as its predecessors. I was hoping that horrible Vicky would finally get hers for being such a rotten person. Also think that Mary and Cy are great together, her friend should also have a love interest, Kyle perhaps? i really enjoyed reading your story. I'm really excited for the sequel. I absolutely LOVED your story! I had been browsing for another book actually when I started reading this. I've been here for hours reading it and I don't regret it! It was a great book and I plan on telling my friends about it. I can't wait to read Unicorn Bait. Please keep on writing, and the best of luck! Commenting to say thank you to everyone. I am working on the sequel. I hope to start posting it January 1st, 2009. Will leave a link when it's up and ready to surf. Really an amazing story. I like those kind of both funny and exciting teenage stories. Keep on the good work. Thanks, mydien. Hope you try out the sequel. yep, i definitely loved this, quite predictable at times and not much character elaborations but good job! next time, work on twists and character personalities. you did a good job with rachel and grandma and vicky, but not so much with cy and mary. they were the main characters! and they keep switching personalities. it's kinda confusing. and yeah, the comedy of it all got me hooked. can't pass a chapter without laughing at the least. the last line was absolutely G.E.N.I.U.S.! you got me when mary released julie. it was the greatest twist in the story. even greater than the revelation of kyle being possessed. pharmac, thanks for all your comments. Curious about your comments about characters not evolving and staying in character especially concerning Mary. Kyle/Mary will have to wait, but something is brewing in the sequel. Cheekylil, glad you liked the part about the locket. I was pretty proud of myself when it came to me. The original draft didn't have that twist. I just hope Marry should end up with something happier. Cy was too cold for her, he didn't even know what happen. Also, the whole school should at least knows her ability instead of picking or whispering on her. Anyway, it is not a bad ending. Ninja thingy really cracked me up, amazing. pharmac, thanks for coming back to clarify. Cy was a tough character to write. I think you might be right about the ending. I think part of it too is that we don't see why Cy gradually have a change of heart so his encounter with Mary at the end does seem abrupt. I'll have to think on how to fix it if I can. *Born to read* Glad you enjoyed it. I couldn't do a happily ever after with Mary because I want to give her more stories and having her ride off into the sunset would prevent that and a happily ever after just didn't seem right to me, but Mary does deserve to be happy. WOW...THIS BOOK IS ABSOLUTELTY GREAT..I'D RECCOMMEND IT TO ANYONE LOOKING FOR SOMETHING TO ENJOY....I LOVE IT...WISH I COULD FIND A BOOK THAT GOOD AGAIN!! beautifulangel_16, thank you for your lovely comments. They brought a big smile to my face. There are thousands of good stories to read. May I recommend Tamora Pierce, Garth Nix, or Diana Wynne Jones just to name a few. Applause! Great ending, definately better ending than Unicorn Bait. I loved the story. I really did. I like you style of writing. Thanks for a good read. I love google... forgot my book today at lunch, and asked for online fiction... after a bit of browsing thought this looked good. Browsing for a good book to read and am really glad to pick yours. Enjoyed it all. Also enjoyed reading the comments after each chapter. I was actually picturing the scenes in my mind. One of hobbies is READING and your SCARY MARY is trully a great one to see. I really enjoyed reading this - thank you for such a fun read! I really liked the simplicity... and yet this story has tumultuous emotions, and the thing between Cy and Mary is really cute. And the story had me HOOKED! Very very interesting!! 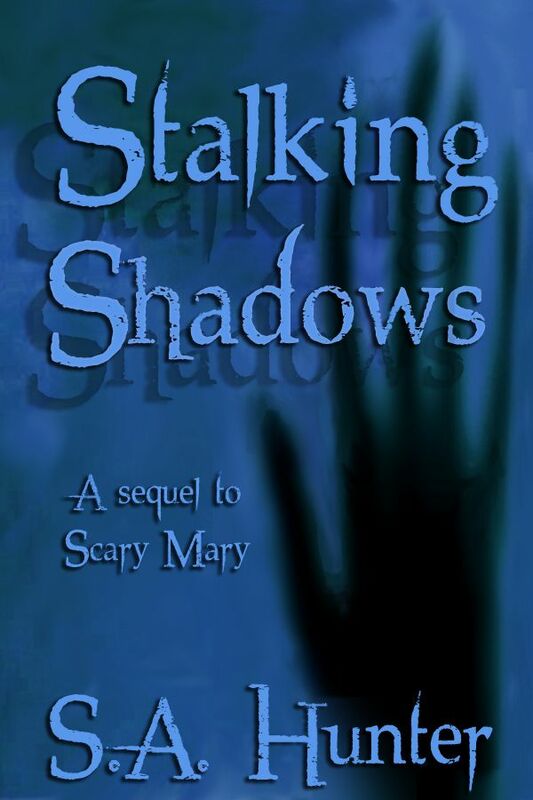 I found your sequel first on www.webfictionguide.com and wanted to readit but rationalized that I should have the backstory first, I really enjoyed Scary Mary and am headed to read Stalking Shadows now. I have also read Unicorn Bait and enjoyed it as well, so Thank You very much for the great reads!! Thanks so much! You're making me blush. So happy to hear you liked SM and Unicorn Bait. Hope you enjoy Stalking Shadows! I have just finished your book and I thought it was amazing. I am writing you this email to say thank you for putting it online. I really enjoyed it. I'm not sa critic, but was bored at the office and did an online search for free reading material, started reading this. I've read about 2 chapters in between calls starting late last week. I got hooked and finished it off. This is a great in for a series of short stories. You have such a great writing style, detailed enough that you can imagine the characters and story but keep the story moving along at a great speed. A strong character, Mary, you could write her into a bunch of adventures! Keep up the good work! Glad SM could make work go by quicker for you. Hope you have a chance to try Stalking Shadows. Sorry, your comment seems to have slipped by me. The sequel is up. Stalking Shadows is free to read online. The ebook edition is in the works. My daughter left page open on iPad and I started reading. I'm 41 and I loved it. Even got the heart racing towards the end. You should be very proud. Well done. Loved it..
Found this through onlinenovels. I'm not really into witches and ghosts. (Too much of that seems to be going around these days.) I had to take a chance, though, when I read "humor" in the summary. The quips and quick pace kept me reading. I think my favorite part of the whole story was the paragraph about Mary's secret identity - using small appliances and refusing to go around wearing a cape. Great stuff. I, too, think the change in Cy at the end is confusing. At first Chowder's part in the story didn't make sense to me. Now I think the invisible dog was a necessity for the plot. His 'presence' (heh heh) brought a cohesiveness I didn't expect. Thank you so much for taking a chance on Scary Mary. :-) I've heard from a few others recently that the change of heart with Cy doesn't ring true for them either. I may have painted things a little too rosy. Things certainly aren't as cheery as they appear which becomes apparent in the sequel. Thanks so much! Hope you enjoy Stalking Shadows! I recently read this and LOVEDD ITT its stalking shadows a sequel or another book you made ? I want a sequel , and does stalking shadows start how this ended? I hope so but if stalking shadows isn't a sequel please make one and please respond !! Stalking Shadows is the sequel. It starts a few months after Scary Mary. I hope you like it! Thanks!